I need to talk about today. Because today has been, well, awful. James and Sophie went to school today. But everyone has been sick, at some point, since Thanksgiving. For all of us it’s been a feverish cold but then today Owen threw up his toast. And now he’s hungry and yelling at me and I can’t do anything about it. Our furnace sounds like it’s some strange being from a horror movie and the warmest it’s been in our house all day is 66°. James fell asleep 10 minutes before we had to leave to pick up Sophie. When I woke him up he, still half asleep, punched me in the arm, over and over, he was so angry with me. Owen refused to walk to the van and refused to let me carry him. When I finally picked him up he kicked off his rain boots and screamed about the injustice of it all as I took off his thick winter coat, leaving him to freeze in his pajamas as I buckled him in his car seat, barf bucket next to him. I picked up Sophie in the infuriating car line (not wanting to make Owen walk to school today) and she said she presented her gingerbread person today and I was so excited to hear all about it because she was so excited to decorate it—her first big, at-home school project. She was so-so throughout the whole conversation and then said everyone else in her class had their parents help them with their gingerbread people and the directions said parents were supposed to help and she asked me to help but she said I said I was too busy to help and apparently all the other kids’ gingerbread people were much more fancy. I remember saying I was too busy at.that.exact.moment but I also remember asking her if I could help later and I remember her saying no, that she wanted to do it herself and I thought her gingerbread person was beautiful. Yes, the outfit was simply colored with crayon but it was so lovingly detailed and I thought the hair was so clever—twisted pipe cleaners, totally her idea. But in the end, this wasn’t nearly as fancy as all the other gingerbread people. I’m close to tears and she’s close to tears and I think we’re all exhausted. Exhausted from travel (Baltimore, TN, and Lewisburg, Ohio the last three weekends). Exhausted from Christmas, already. Exhausted from school, freelance work, laundry, homework, life. We have sore throats and sniffles and beautiful gingerbread people that we feel are lacking (even though they aren’t) and looming deadlines and 20 minutes of reading every night and agents who are finally answering their 2014 queries (which means seemingly every-other day rejections coming my way) and neighbors who have the most amazing Christmas lights all over their house (ours are not yet up), lights that include a countdown to Christmas, which is not at all helpful in terms of my level of stress. Here’s a picture from this weekend. 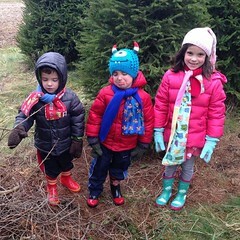 It’s the best one I have of all three kids while cutting down our Christmas tree. Owen is crying because he insisted the tree we chose was too small, despite our many conversations about the limitations of our home’s ceilings. This entry was written by kara, posted on December 9, 2014 at 4:56 pm, filed under All and tagged christmas, Christmas tree, days like this, illness, project, school, sick, tree. Bookmark the permalink. Follow any comments here with the RSS feed for this post. Post a comment or leave a trackback: Trackback URL.